Each year Europe’s biggest street fair takes place right on the west side of London in the streets of Notting Hill. 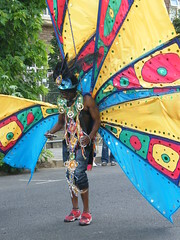 With Caribbean flair and thousands of elaborate costumes, the streets of Notting Hill come alive. The festival that runs August 28th and 29th is the biggest street fair in England. With many vendors (hundreds literally) selling tropical and ethnic flair food, parades, and up to 40,000 volunteers the Notting Hill Festival of 2011 will be going strong this year. The street fair runs the full twenty miles and boasts over 40 major sound systems to keep the music flowing and inspire a positive atmosphere for the festival. A sort of musical backdrop if you will. It is expected that like years previous London with produce over 1 million street fair attendees. Your London relocation agents can give you more information on the festival and the best ways to attend so that you hit all the major highlights of this year’s event. Started years ago as an Indian event, it has morphed over the years into a true Carribean flair that begins with the musical events on the Saturday before Monday’s bank holiday, August 27th. The steel drum musical competition is held on Saturday, with kid’s day being on Sunday, and Monday reserved for adults. The streets will close by 9:00 am and the festivities end each night around 9:00 pm. Previous years have shown that the northern entrances are quite busy and it is advised that participants enter in a southern point. Starting on the Great Western Road, the parade then will pass by Chepstow Road, and follow along Wesbroune Grove, and then on to Ladbroke Grove. Later in the evenings there are quite a few activities to attend. Around adult only after hours times, one will find many all-night party clubs and celebrations. In the evening, the floats leave the streets in procession, and people carry on just continue to party at the many Notting Hill Carnival after parties. Relocation UK is so much fun in attending the local London events.